Gary Warren Traffic Technician SCC, Helen Rutter SSDC Area Development, Anna Groscop, Somerset County Councillor, Colin Winder South Somerset District Councillor, Maureen Emery Wincanton Town Councillor, David Norris Wincanton Town Councillor, PC Andrew Brown and PCSO Jenny Maynard, Deputy Town Clerk Muriel Cairns, and Barry Taylor, Chairman. 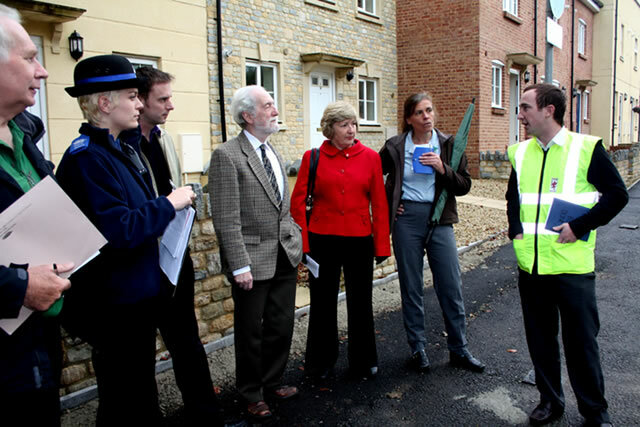 This was the first time I had been on one of these walkabouts which are intended to provide an opportunity for the public, the police, and council members, town, district and county, to look at issues on the ground which may have been raised by any of them before final decisions are made. Our first call was to look at the area where the path comes down from Churchfields to the crossing point on Station Road where Cemetery Lane leads to the Recreation Ground. Colin Winder reminded us that the Town Council has been asking the County Council to build a pedestrian crossing here for about five years. It is needed because children coming out of school wanting to cross the road are constantly faced with very fast traffic going along Station Road. Everyone agreed that the pedestrian crossing was needed and Gary Warren reported that the property developer Hopkins Ltd and the Highways Department would be having a meeting in two weeks time. Hopkins Ltd would bear the cost of the crossing as part of the agreement reached over the new properties that had been built by them on either side of the road. When asked when was the likely time for building to start, Garry Warren said it could be before Christmas. Several pointed out that this could have a devastating effect on High Street shops, as it could hit them just at the time when they were hoping for good pre-Christmas trade. Colin Winder suggested that as the work was being done without a road closure, disruption would be reduced, and it was still worth pressing for the earliest possible date for the work to be carried out. Otherwise it was likely that the decisions would be postponed and things could drag on for months as they already have done. Garry Warren proposed as a useful interim measure that the County Council could erect warning signs to slow down motorists. These would remain after the pedestrian crossing was built and "would only cost around £300.00". All agreed with this proposal. The Next stop was to look at where Balsam Fields joins South Street / Tout Hill. Here there was discussion about the need for some double yellow lines near the corner, for it was suggested that if cars parked right to the end of the road it was difficult to see traffic coming down South Street. This raised the more general problem of what was going to happen when Balsam Fields becomes subjected to a much higher flow of traffic when the new property development is completed beyond Deansley Way. If yellow lines were introduced along Balsam Fields this could make life very difficult for those who presently rely on parking on the road outside their homes. Where else could they be expected to park? Garry Warren was again questioned and he explained that while in the past while the building and upkeep of roads had been a County Council responsibility, the marking of roads with additional lines by the District Council and other agencies has led to confusion and that many of these lines were not legally enforceable. As of next year 2010, this would become a County Council responsibility and staff in the County Council were working on producing a detailed road map of the whole county which would show exactly where there were yellow lines and other traffic signage. Again he emphasised that there would be an opportunity for public debate before this plan was adopted as legally binding and concern was raised within the group that such decisions could have very serious consequences for those who might find they could no longer park outside their homes. Other issues were also discussed, such as the position of litter and dog bins, and the need for the road signage to be revised and updated. The signs required for the "Dead end" to Dancing Lane at Verrington hospital should be progressed. It seemed to me that this "walk-about" showed how important it is for people to know what is being discussed and planned so objections can be raised and people properly consulted. It is very easy for decisions to be made that look good on a map in Taunton but could cause misery and financial loss in Wincanton.